19-Year-old Marelize could not believe her ears when Martin Bester blew her away with the biggest surprise. 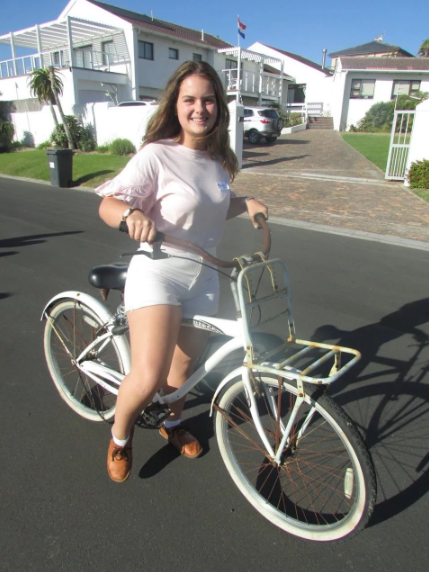 A short video of a woman crashing her bicycle into rugby poles has spread like wildfire across South Africa. The video resonated with many, not so much because of Marelize's lack of coordination, but mostly because of the reaction of the woman recording the moment. In the video, Marelize is seen riding her bicycle on a rugby field at Affies Park in Windhoek. After riding for a few seconds she then heads straight for the rugby poles, before crashing into them. Marilize joined Breakfast with Martin Bester on Monday morning to explain how she ended up falling and why her mother used that particular phrase! Listeners were incredibly excited that they are going to meet Marelize at Off the Beat 'n Track! Martin Bester surprised Marelize by giving her an airplane ticket courtesy of British Airways, operated by Comair to join us at Off the Beat 'n Track! You too can join Breakfast with Martin Bester and Marelize on 13 April at the Big Red Barn in Irene!